There are many reasons the Android-based Asus Transformer Prime looks appealing. In an early review, PCWorld's Melissa Perenson called it "one of the best tablet values today." Here are five reasons why your next work laptop could be a Transformer tablet. Whether it’s taking notes or accessing important documents while in the field, checking into email, or working from home, there is a need for portable computing. As it’s only 10.35 by 7.12 by 0.33 inches, and weighing just 1.29 pounds, the Transformer is even more portable than the smallest of laptops, yet its 10-inch, 1280x800 pixel display is large enough for doing real work. Tablets aren’t often the first choice for extensive text input. Using an onscreen keyboard for a quick text message is fine, but even entering a long URL, much less writing pages of text, can be a pain. For those who prefer a physical keyboard, the Transformer Prime’s included keyboard dock is a welcome addition. You can carry the tablet alone, or just connect the Transformer with the keyboard and it becomes the hardware equivalent of a laptop. The dock includes not only a keyboard but also a touchpad, as well as a USB port and a card reader. The tablet alone weights 1.18 pounds, and becomes only 2.47 pounds with the keyboard--barely heavier than Apple’s tiny 11-inch, 2.38-pound Macbook Air. Sometimes you need to work all day without access to a power outlet. Laptop makers promise long battery life, but in common usage, most won’t provide more than five hours, considerably shorter than the average work day. Tablets with mobile operating systems are designed with battery life as a core consideration. Asus says the Transformer battery will last 9.5 hours playing 720p video. You can extend this to 18 hours when connected to the Prime keyboard dock, allowing true all-day usage. Stay tuned to PCWorld’s review for full battery test results. If you work on the road, you probably already use cloud-based apps like Google Docs or Office 365. There’s no need to change, as those apps work fine on the Transformer. If you don’t have network access, Asus includes Polaris Office, and other apps like Quickoffice HD Pro are available in the market, which allows viewing and editing of word, spreadsheet, and presentation files that are stored on the tablet itself. For the software you need to use that only runs on PC or Mac, the Transfomer includes MyDesktop software, but the market also includes many other apps which allow remote control of a PC or Mac as well. It doesn’t matter what the specs are on paper if the actual performance of a device is slow as molasses. 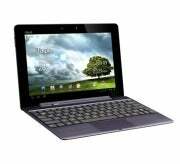 The Transformer has Nvidia's 1.3-GHzquad-coreTegra 3 processor, making it the first quad-core tablet. Much of the software that runs on Android hasn’t yet been optimized to take advantage of this level of power, but it already performed well in PCWorld’s early tests. Tablets are still young, and the Transformer isn’t perfect, but for what it offers, many workers could toss their laptops in exchange for a tablet and not look back. The Transformer promises to get even better as an upgrade to Andoid 4.0, Ice Cream Sandwich, is promised. Performance will also improve as more apps are optimized to take advantage of the quad-core processor. Would the Transformer meet your business needs? JosephFieber has 25 years experience as an IT pro, with a background in computer consulting and software training. Follow him onGoogle+,Facebook, orTwitter, or contact him through his website,JosephFieber.com. The Transformer Prime outclasses the competition with its svelte and stylish design, its beautiful display, and its beefy specs.